WaveLab est une solution tout-en-un pour le mastering professionnel, l'édition audio multicanaux haute résolution, la restauration audio, le design sonore, la production de CD/DVD-A. The update adds several improvements in areas such as plug-ins, user interface and audio montage. Version 8.0.1 resolves several issues in the areas of user interface, rendering, Workspaces and plug-ins. WaveLab 8 features a brand-new speaker management system, loudness metering and processing, single-window plug-in management, a master control panel, iZotope’s MBIT+ master dither, Voxengo’s CurveEQ, brickwall limiter and tube compressor, SuperClips, metadata support and over 150 improvements to its user interface and comprehensive tool set. 7.2.1 update addresses some crash bugs and other issues. WaveLab 7.2 is the latest free update to Steinberg's award-winning solution for mastering, audio editing and restoration. The new version includes 64-bit versions for Mac and Windows platforms and adds full remote control support for Steinberg's CI, CMC or CC121 control devices or any other MIDI-compatible hardware. Other highlights include an Export-to-SoundCloud function, an updated version of the Dirac algorithm and several workflow and user interface improvements. Of course, WaveLab 7.2 is also ready to be used with up to three other MIDI-based control surfaces supporting the MIDI learn function, which lets you easily assign the controls of your hardware to a specific parameter within the application. Share your recordings with people around the world — SoundCloud is the perfect place to let others hear what you have recorded, mixed and mastered. With WaveLab 7.2, uploading a track to your SoundCloud account can be done within just a few clicks. Simply choose "Upload to SoundCloud" in WaveLab's File menu or the option in the WaveLab 7 render dialog and you are done. WaveLab 7.2 features an enhanced DDP file workflow. Once you have created a new DDP file, WaveLab 7.2 automatically offers a button that let's you import the DDP file directly into the Audio Montage area for further adjustments. Handling several projects and revisions of opened sessions can often be confusing. WaveLab's Save As function now includes a Save Copy option. No matter if you want to save an audio file or the entire Audio Montage — when this option is activated, a copy of the opened document is saved and the document continues to refer to the source file. The CD Wizard now includes options to name and rename markers and the CD Report dialog contains a text-based report generator. Plus, the total CD time is now being displayed within the CD tool-window. In addition to the internal WaveLab scripting possibilities, Windows scripting allows you to control WaveLab from an external application (not to be mixed up with internal WaveLab scripting). The new update will further improve the stability and usability of WaveLab 7 in areas such as plug-ins, file handling, transport, Audio Montage, burning engine, Batch Processing, key commands, time-stretching and the graphical user interface. Steinberg ouvre ce jour un nouveau chapitre de l'histoire de WaveLab, qui a débuté il y 15 ans. Pour la toute première fois, la solution d'édition et mastering audio renommée dans toute l'industrie devient disponible pour les stations Mac et PC (Windows). Reposant sur un code paré pour l'avenir, WaveLab 7 combine une pléthore de nouvelles fonctions et fonctionnalités avec une façon de travailler totalement unique. De nombreuses technologies avancées ont été implémentées, comprenant notamment le support VST3, les algorithmes de time-stretch avancés, un moteur de gravure haut de gamme plus le support du DDP. L'interface utilisateur de WaveLab a été complètement repensée, et propose à présent une puissante gestion des espaces de travail, des barres à outils personnalisables et un système d'aide embarqué. En plus de ces nouveautés qui vous feront gagner beaucoup de temps, WaveLab 7 propose une gamme d'outils complète pour le mastering et la restauration d'audio pour les professionnels, avec la suite de restauration et de suppression efficaces de bruit de chez Sonnox, plus 30 plug-ins VST3 hautement acclamé de chez Steinberg. The new update includes a wealth of enhancements and addresses issues that have been reported by our valued customers. fixe : la fonction "When opening Wavelab, set this folder"
fixe : d'autres petits bug . 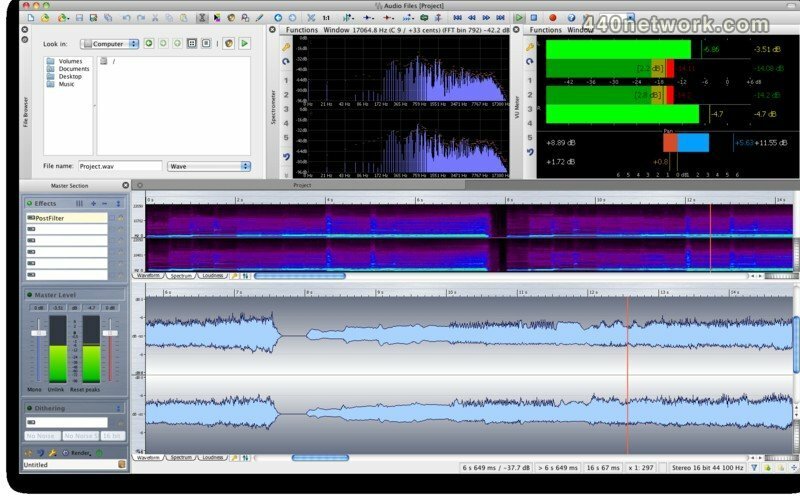 WaveLab 6 offers an advanced new Spectrum Editor with its sonogram view. 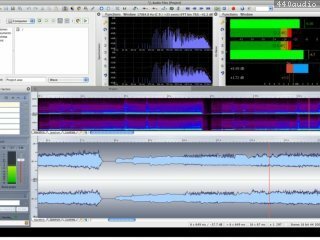 This exciting new editing tool allows ultra-fine surgical editing of the audio file's frequency information, allowing a range of procedures such as the complete removal of unwanted noises or frequency ranges. This exceedingly flexible editor employs highest quality linear phase filters and offers many exciting new sound replacement options including cut and paste of an audio file's background ambience to another part of the file or plug-in processing on selected frequencies. DIRAC is among the most advanced algorithms for time-based manipulation of audio material available today. Excellent audio quality, outstanding performance and maximum precision are among the superlative qualities this technology brings to WaveLab 6. Its flexibility allows it to be used on a huge range of audio material including vocals, drum loops and classical string ensembles to name just a few. The settings and plug-in chain in the Master Section can now we saved as a preset with the audio file or audio montage. This allows the simultaneous editing of several audio files or versions while retaining all the vital settings in the Master Section. The enhanced new Master Section now also offers a useful and time-saving new function: SmartBypass. This automatically compensates the different loudness levels of original and processed audio, allowing a lightning-quick A/B comparison. The Crystal Resampler is a top-end new sample rate converter supporting up to 384 kHz, with other new additions including time-saving new tools such as the Loudness Normalizer and the Smat Silence plug-ins. The powerful Audio Montage environment has been upgraded even further with WaveLab 6, offering new functions such as new fade editing features, batch processing and extended import and export options. WaveLab 6 places no limit on the size of clips, and even files exceeding 2GB in size can now be imported. Other optimizations include enhanced performance when reading and writng files, automated renaming of files as a batch process and a new file list manager handling access and sorting of up to 200 hundred recent audio files. WaveLab 6 offers a range of new metering and monitoring tools including the Loudness Distribution window and a new Waveform scope display. WaveLab now also supports the K-System metering standard developed by mastering legend Bob Katz. A further highlight is the full integration of external effect hardware within the digital mastering process. With WaveLab 6, any favorite analog hardware unit can be used within WaveLab, combining the advantages of both the digital editng and analog processing domains into one personalized, integrated mastering environment. Version 6 also supports MIDI remote controllers, allowing intuitive, immediate control over many software functions from a compatible hardware controller. Regarde sur leur site officiel: pour les démos, je n'aperçois que Cubase & Sequel ! Enfin sur mac, j'espère qu'il y aura une version démo.